Twenty years after the Exxon Valdez, a pitiful cleanup effort. Chris Matthews show, where he was talking to Dwayne Spradlin. days after the gusher begins, a plan is put in place to fill and cover. could be in worse shape than before." planned methods to seal it, because there would be more openings. There is a lot of talk about a series of pipes. What are these pipes? BP never wanted to STOP the gusher in the Gulf. All they want to do is TAP it. They are totally without a conscience. closed the opening & saved the ocean. could push oil back down the pipe with high pressure. Other explosives could seal pipe. They say nothing works a mile down. Can't enough tons of gravel and dirt be found to stop the gusher? An oil well is a tunnel going miles down into rock. Please explain why explosives cannot collapse and stop. My comment here, and all those above it, have been deleted. far greater than the number of comments shown. Many of these articles seem to have the EARLY comments cut. it's the only name that right-wingers won't want to call THEMSELVES. Talking Coffee Party on the show tonight? Maybe. many Democrats who are thinking in terms of a "go-for-broke"
block to push the party agenda. Either you show us that "the system"
Maddow calls it: Republicans cannot stop health reform. All of this argument over the true meaning of the term "nuclear option"
The "true" meaning of the "nuclear option" is the use of a "Bomb,"
Ever Met a Republican Not Owned by the Insurance Industry? ONCE on Wednesday's show. You say you want to end the filibuster. Down to the wire in our Filibuster Challenge. Who's taking a stand on the filibuster? 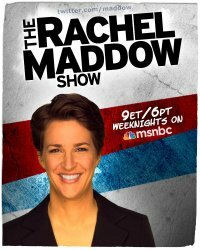 Rachel will be address it on tonight's show. in responding to international disasters. than the red letters in their Bibles. The doctrines of the "religious-right"
Now, it's gift certificates for Hooters. Health reform opponents resort to digital dirty tricks. cannot be used. What we need to do is to amend the Constitution. of opposing it. A lot of crooked corporations would go out of business. Republican economics. The election results would be the same. Howard Dean’s choice of words. The problem here is the FILIBUSTER. place, to obstruct all government business for the foreseeable future. being mean." This is ridiculous. It just isn't possible to be "tough"
called "bad." So then what Democrats have to do is to be "badder"
Who is "on the wrong side of history," and who is on the "right" side? AfPak, how 'bout this one instead? WaPo wins best correction of 2009? Comedy Central produces an hour of news analysis, 4 days per week. Three with China, and he wanted to use the full arsenal of "atomic"
Other comments to be posted later. fixed after I complained about it. I can't leave any comments, because I don't have a cell phone. mentioned in Genesis. The claim that "This Earth has been here for 6000 years" .